Sending message to a dedicated group of users is tough through the normal methods. And when your content for every user is different, the job becomes even tedious. 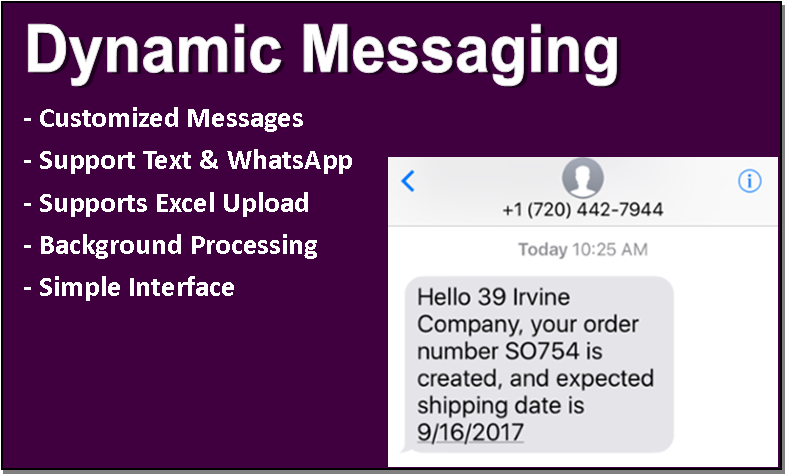 With this Advanced Dynamic Messaging add-on, sending dynamic/personalized messages is so easy and fast! You can simply upload an Excel file containing the recipients with other dynamic fields and the system will customize the message for each recipient. This add-on works with your Sendroid Ultimate routing rules and supports Text, MMS, Unicode and WhatsApp. Send your message and the system will automatically customize your message for each recipient while sending the message. Once enabled, this add-on will be accessible from Extras -> Dynamic Messaging.